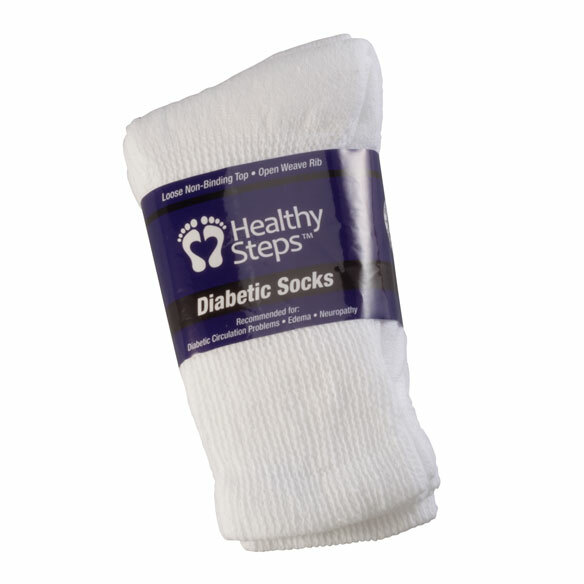 Reduce the risk of irritation and blisters with these Silver Steps™ Seamless Diabetic socks. Designed to help diabetic feet stay warm, dry and healthy, they feature a non-binding, non-restrictive fit with no seams in the toe or heel. Smooth, seamless fit helps prevent bulk and pressure points that can cause blisters. Their soft, breathable comfort is perfect for anyone with diabetes, circulation problems, edema or neuropathy. 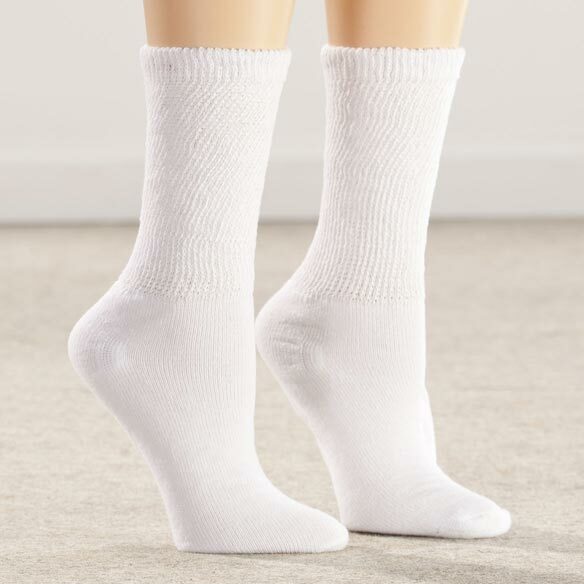 Includes 3 pairs of seamless socks. Non-binding socks made with 80% cotton/15% polyester/5% spandex. No more swollen legs with tight socks. Most comfortable soc have ever owned. Wear the sock on a daily basis. Bottom fits and feels nice but top is slightly thin. Like these soxs,comfort and price. Because I have neuropathy & have used these in the past. Old ones need replaced. They came in my size. Can't find them in correct size in most stores. My husband has poor circulation in his feet and these socks are comfortable with no seams. these socks sound like they would be more comfortable. BECAUSE FOREIGN TEXTILE MANUFACTURES DO NOT GET IT RIGHT! These are for my wife and she likes them very much so am ordering more. Since my feet tend to swell, these are never binding and are comfortable. My mom is 91 and these are seamless and easier on her feet. 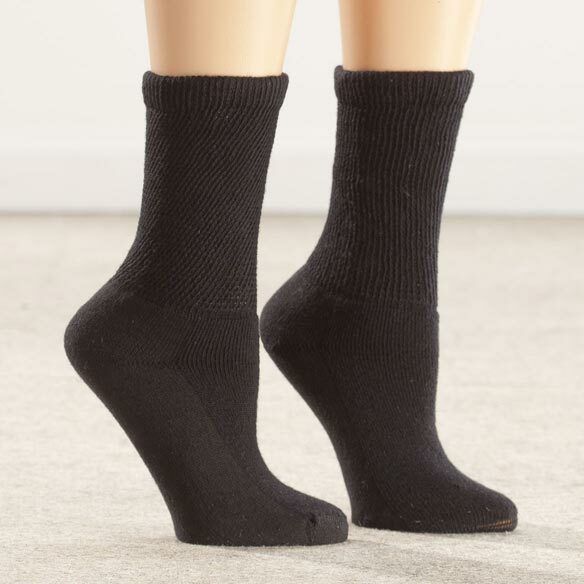 Looking to find comfortable socks since I have neuropathy. Hope these work. Its my first time to order. want to see how comfortable they are. 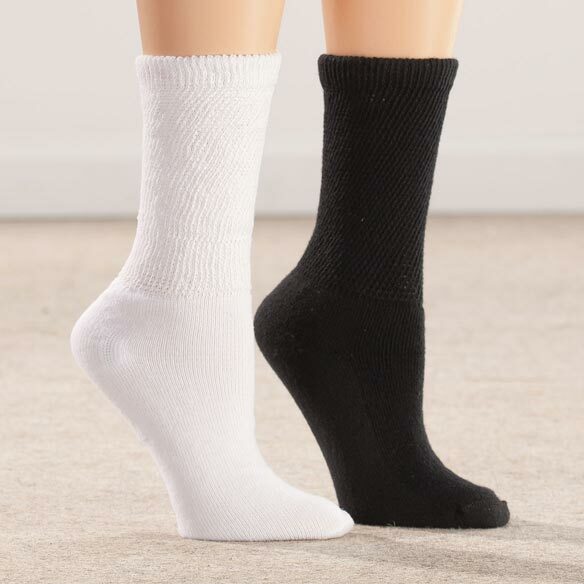 I am looking for sox that are comfortable, easy to put on and off, and stays up. I have not bought these before so I am hoping they will work for me. Husband has diabetes and regular sox don't fit right. I NEED SOMETHING TO MAKE MY LEGS AND FEET FEEL BETTER. My sister and I need seamless socks because we have problems with different kind of socks. bought before. Run a little large, so I bought a size smaller this time. These socks appear to be very well made and I particularly like the fact that they have no seams. I think the price is right too. They are easy to get on and very comfortable. Toe seams hurt my feet. For comfort, qualitiy and type of sox. xl is a hard to find size. 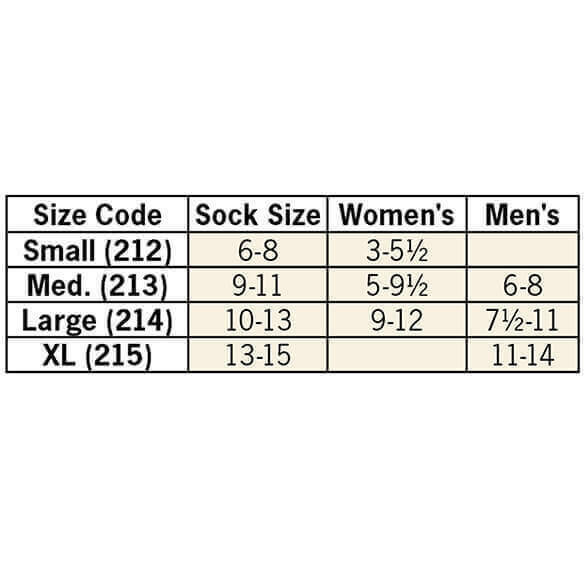 is medium sock right for size 8 shoe? BEST ANSWER: Thank you for your question. The medium will fit shoe size 5 - 9 1/2. We hope this information will be of help to you. i have size as 2140 and white only what size is that? BEST ANSWER: Thank you for your question. Size 214 is Large. We hope this information will be of help to you.